This guide is aimed at owners of Logitech mice that have extra buttons and would like to configure them for various program or application-specific settings. By using a program called uberOptions in addition with SetPoint, Logitech’s keyboard and mouse control software, you can configure your mouse buttons to do different things in different programs, without having to manually change button configurations all the time. This is especially useful to the Logitech mice that have many extra buttons, as the buttons, being close to your finger tips, can be used for time-saving shortcut commands across multiple applications and games. The uberOptions site is back online at a new URI. Please ignore any outdated or broken links in this article as I work to fix them. I originally wrote a short blurb about using uberOptions and SetPoint to get more out of your Logitech mouse, but decided to turn it into a longer guide with more information; uberOptions is a neat program that modifies some of SetPoint’s configuration files in order to allow all application-specific settings for many more Logitech mice than just a select few, and allows for almost any option or command to be assigned to any mouse button, and thus makes it possible to customize your mouse much more. A lot of people might be wondering what all this fuss is about. Most people don’t have a mouse with more than three buttons (the standard left/right and wheel configuration), and most won’t care for or need one. But, for the rest of us, mostly tech-saavy people who enjoy and use their computer a lot, having a mouse with extra buttons can be a useful time saver, akin to learning keyboard shortcuts. 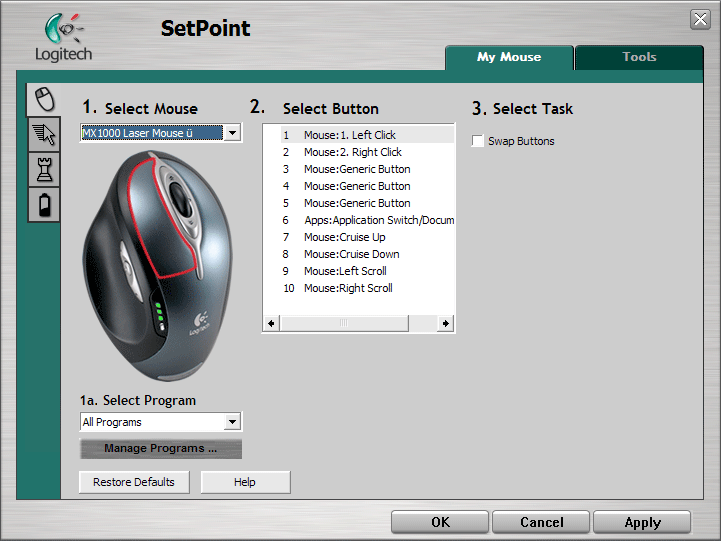 SetPoint does an alright job of allowing customization of your mouse. Most of the buttons can be bound to a range of options, but some buttons are limited to certain functions. 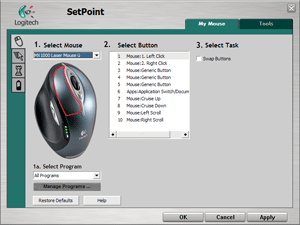 Furthermore, most Logitech mice don’t “support” application-specific settings through SetPoint – so once you bind actions to certain buttons, they persist no matter what program or game you are using, thus limiting the mouse’s functionality since different programs or games might use different keystrokes or actions. However, this is an intentional software limitation, not a limitation of the mice themselves. For example, the G7, G5 and MX610 mice from Logitech will have application-specific settings available, but other mice, such as the MX1000 won’t have this option available. To me, this sort of intentional limitation is mind-boggling – but perhaps it’s part of Logitech’s market strategy to set apart certain mice as having “features” that others do not. Or, perhaps they have just forgotten to update their SetPoint software, but I find this hard to believe. Thankfully, a nice fellow by the name of Richard Lowens has written a nifty program, called uberOptions, that changes the configuration files of SetPoint to enable all of the “disabled” options for almost all Logitech mice! Since all this required was modifying some XML files that stored the configuration information for each mouse (and thus determined which had application-specific settings and so forth), once the program has been installed, it doesn’t need to be run again. Thus, you won’t have another program that must always be running in the background, which should cut down on system resource usage, if you’re concerned about that sort of thing. It’s thus a fairly elegant solution. Before beginning, you’ll need to head over to the uberOptions site and download the program – it’s a relatively small download at only 6.3 MB and so shouldn’t take too long. You should also check out the list of mice supported to see if yours is on the list. Most of the Logitech mice with extra buttons are supported, including the popular MX1000 and MX518 mice. The MX610, G7 and G5 mice are also supported, but as mentioned before, they already support application-specific settings, so all you’ll get out of uberOptions is more options for the buttons. Note that the older MX700 (original Logitech cordless rechargeable) and MX500 mice are not supported, not because uberOptions doesn’t support them, but rather, SetPoint doesn’t support these mice. Someone might be able to write a configuration file for these to enable support in SetPoint, but I’m not sure if that’s possible or whether it’ll happen – for now, you’re stuck using the older MouseWare for these and older Logitech mice. See further down in this guide for more information. You can see that uberOptions is installed, because it appends a “Ã¼” character after the mouse’s name. The options for each mouse button also look slightly different. As you can see, I’ve left almost everything to the default, except for changing mouse buttons 3, 4, and 5 (the middle, back and forward buttons respectively) to “generic” buttons for “All Programs”. As far as I know, Windows XP supports the first five buttons natively, so this is why I’ve set them to generic buttons. This allows them to work just fine in the desktop and in web browsers. The “Back” and “Forward” functionality is especially useful when moving through directories or browsing webpages – I don’t know how I lived without it before! As you can see, uberOptions enables almost any functionality to be assigned to any button. The sheer number of functions available is astonishing, and almost confusing. While it my seem daunting at first, it allows for full customization of the mouse’s buttons, which you should be able to do, since it’s your mouse anyways. In fact, you’ll probably not want to change most of the default button assignments for “All Programs”, as things can get a little messy. You’ll probably only want to change the button assignments for application-specific profiles, which I’ve been ranting about since the start as being the most useful ability. That little drop-down box opens up a world of options, customizability and improvements for your Logitech mouse. Basically, you can assign profiles or configurations of buttons to specific programs or games. You can add any EXE file to the list, and when SetPoint detects that executable as having focus (I.E, the application is in the foreground, or you’re playing the specified game), it will use the button assignments you’ve specified for that application or game! This basically allows for infinite configuration possbilities. In the example screenshot, I’ve added Guild Wars to the list, where for that profile, I’ve assigned a bunch of keystrokes to the extra buttons for more functionality for the mouse in that game. Keystrokes are perhaps the best way to utilize the extra mouse buttons, since most games use keystrokes as input commands of some sort, and using the keyboard for hard-to-remember keystrokes can be hectic in the middle of a game. Note that this may not be necessary for the first five buttons, since if they’re set as regular/generic buttons, they will be detected as such in a game. The other extra buttons (beyond the fifth) cannot be detected in games as “extra buttons” (for example, the application-switch button and tilt-wheel buttons on the MX1000), and can only be used if they’re assigned keystrokes. RPGs are notorious for having a lot of keystrokes and input commands, so using the extra buttons on the MX1000 only makes sense. RTS games can also benefit similarly. 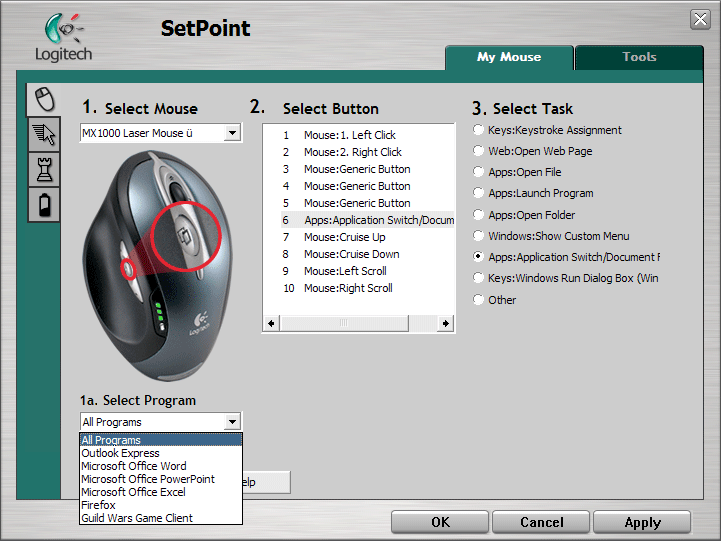 With a properly configured SetPoint and uberOptions, and some adjustment time, your mouse can actually be programmed to do a lot in applications and games! There are some behaviour quirks. For example, when I set a button to “generic” for “All Programs” and then selected it again in the options, the ability to set a per-application setting for that button disappeared. If the mouse button were set to something else, the application-specific settings (the “Manage Programs…” button) re-appeared. I’m not sure this is a problem with uberOptions, as it could be a problem with the quirky behaviour of SetPoint. I noticed this when I reviewed the MX610, while using it with a non-uberOption’d version of SetPoint. This doesn’t totally prevent you from configuring application-specific settings, as you just have to be careful how you go about things. If anything, it’s a minor annoyance. Maybe it’ll be fixed in a later version of uberOptions or SetPoint. An alternative to uberOptions is the LogiGamer Mouse profile utility, which works with MX500, MX700, MX310, MX510, MX900 and MX1000 mice. Like uberOptions, it allows application-specific settings for the mice, so it basically offers the same functionality and features. However, it’s a separate program that, as far as I can tell, must be running in the background for your settings to take effect. It also requires SetPoint to be installed, and also requires the .NET 1.1 Framework to be installed, so if you don’t like that idea, uberOptions is probably a better choice. 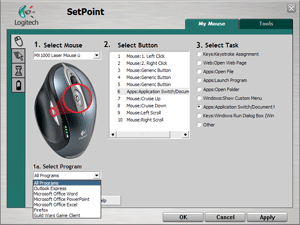 However, if you’re using a mouse that doesn’t support SetPoint, then this program might be your only option for application-specific settings. I hope this guide helped in some small way. For most people, spending extra time configuring a mouse and its extra buttons for specific use in certain applications and games is a foreign concept that doesn’t deserve any attention – I can understand that. However, for us gearheads who get some reward from making something work better than it should, customization is something we can’t be without. Have you been able to assign a key to the application-switch button? I tried to assign it to the keystroke “B” for BF2, but when I push it, it still brings up the app-switch window. I even assigned “B” to the main profile along with my BF2 profile. I am using Setpoint 3 and uberoption 2.91. I see there is a newer version of uberoptions, so I will try that even though the changelog doesn’t sound like it changes anything for the MX1000. I finally got it working. I think it had something to do with setting generic buttons in the all programs profile messing up my game profile. If you like keeping them set as generic buttons, you can usually configure their usage from within the game itself. I wonder if you have any ideas about a problem I am having. I am running SetPoint 3.3 on Vista Ultimate 32-bit with an MX1000 mouse. I have not installed Uberoptions (yet 🙂 ). I am able to use SetPoint to bind, say, the forward button on my mouse to a keystroke, but when I launch a game, and then configure my keys for that game, the game does not recognise the keystroke when I press the forward button on my mouse. This is happening in all 3 of the games I am playing currently, Half Life 2 (incl. CSS, HL2 deathmatch etc. ), Call of Cthulhu, Dark Corners of the Earth and Prey. The same games on Windows XP Pro worked fine with my key-bindings. Any ideas? Would Uberoptions help with this issue? any information on the following situation would be appreciated. currently have the Logitech LX 700 series Desktop/Mouse combo operating on Windows ME. as a replacement I have on the way a MX 3200 series combo. Will I be able to utilize the MX3200 series on windows ME be using uberoption along with any possible upgrade fo the SetPoint software? uberOptions is a great little program. 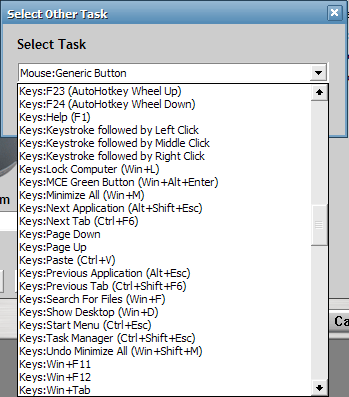 Along with the AutoHotKey macro program, you can get your mouse to do a LOT of repetitious work for you. Unfortunately, it won’t be proofreading this post. Reading this article clued me to try assigning a keystroke to that button globally, and sure enough the application-specific feature for that button started working perfectly. As above, my mouse (the M510) was not supported, but I was able to edit the XML file quite easily. The hard part was finding the right file. Then I found the button or buttons I wanted to customize (look for ). Under <TriggerState …, I changed the property HandlerSetGroup= from something like HandlerSetGroup="MiddleButtonGroup7" to HandlerSetGroup="UberGroup"
Then I found the button or buttons I wanted to customize (look for <button Number=…).. Under <TriggerState …, I changed the property HandlerSetGroup= from something like HandlerSetGroup="MiddleButtonGroup7" to HandlerSetGroup="UberGroup"
never used a feature like this before, don’t be too intimidated not to try them out.